Salad Bar Do’s and Don’ts: meals are one of the greatest perks of being in a sorority, but be careful of what you are putting into your body. You might think you can overload your salad bowl with anything on the buffet, but think again. Heavy dressing, excessive croutons, and too much cheese are the top culprits to avoid. When it comes to selecting, think dark greens! Netflix and Chill Exercise: Turn a quiet night in watching your favorite TV shows, like The Bachelor/Bachelorette, with your sisters into a productive night. Commercials are the always the perfect time to get up and move, or try to make a game out of the show like this exercise game from the last season of the Bachelor! Stadiums: The best place for to get a good workout on campus is the same place you go to Saturdays with your sorority members in your Gator Gear. The swamp is open during the week, so get out there, climb those stairs and #ItsGreatUF. Choose an apartment that lets you walk! : Walking is a great way to burn fat while getting from destination to destination. Lose your scooter keys for the day and use your natural mode of transportation, your legs! 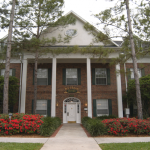 Check out these apartments near sorority row UF. Guest post by: Dana Janney(Sorority Strong founder, Director of Personal Training at Alter Ego Fitness). follow @sororitystrong on instagram, or contact Dana@AlterEgoFitness.com for more on group fitness classes/personal training at Alter Ego Fitness!